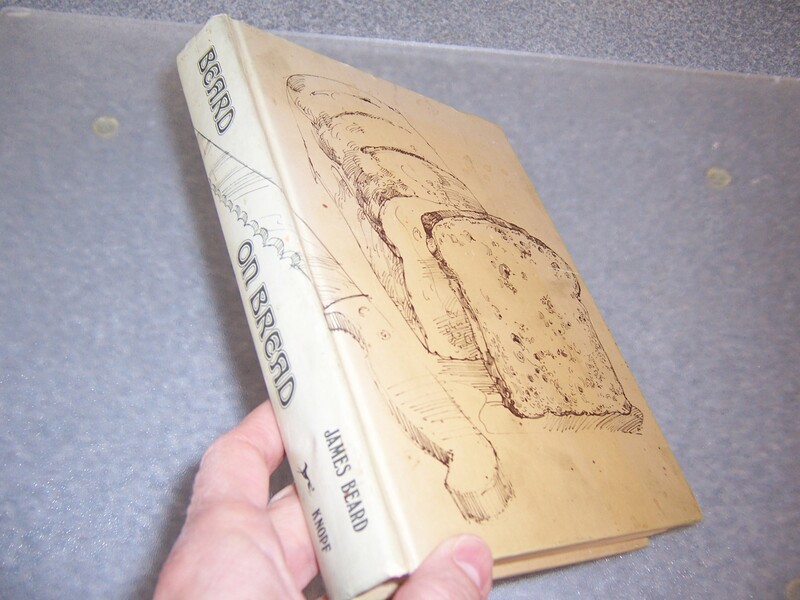 I’ve been baking bread for more years than I care to count, usually with the help of my trusty edition of James Beard’s Beard on Bread. I was introduced to the book by my older sister Julie, who used it to create such delicacies as Monkey Bread, Sally Lunn Bread, Swedish Limpa and just plain ol’ homestyle. The book, with its delicate line drawings by Karl Stuecklen, has an intimate, “I’m-sharing-this-with-you-alone” tone that I’ve always enjoyed, and my copy bears the stains of a tried and true cookbook. 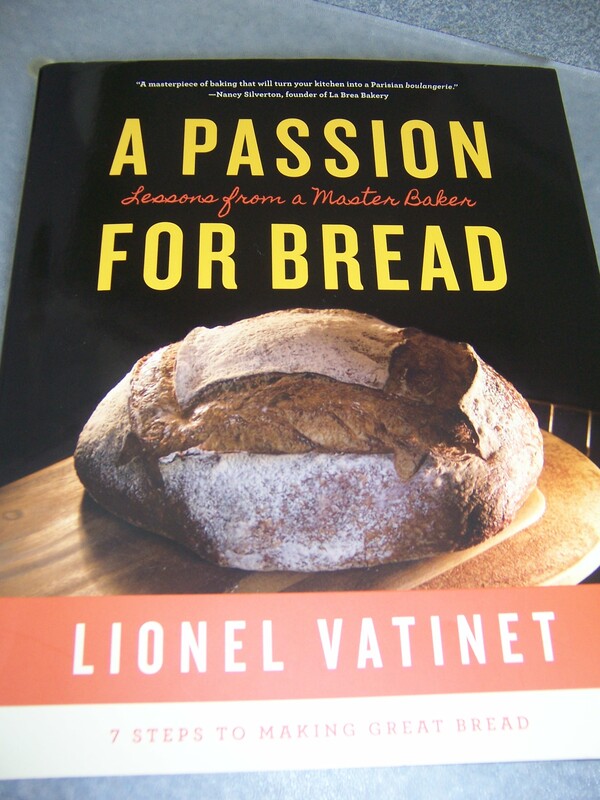 For Christmas, however, I received a new bread book: A Passion for Bread by Lionel Vatinet, an artisanal Master Baker based out of North Carolina. It’s an autographed copy obtained for me by my sister Margaret, who is President of the Board of Directors of Yates Mill Associates, which operates a fully-restored 18th century gristmill in Raleigh, NC. The connection? The mill provides cornmeal for Mr. Vatinet’s La Farm Bakery in Cary, NC. It was almost March before a confluence of time, inclination and ingredients found me in the kitchen with Vatinet’s book before me and my mise en place…well, in place. I opted to try Vatinet’s Country French Bread recipe first, which makes a single boule. 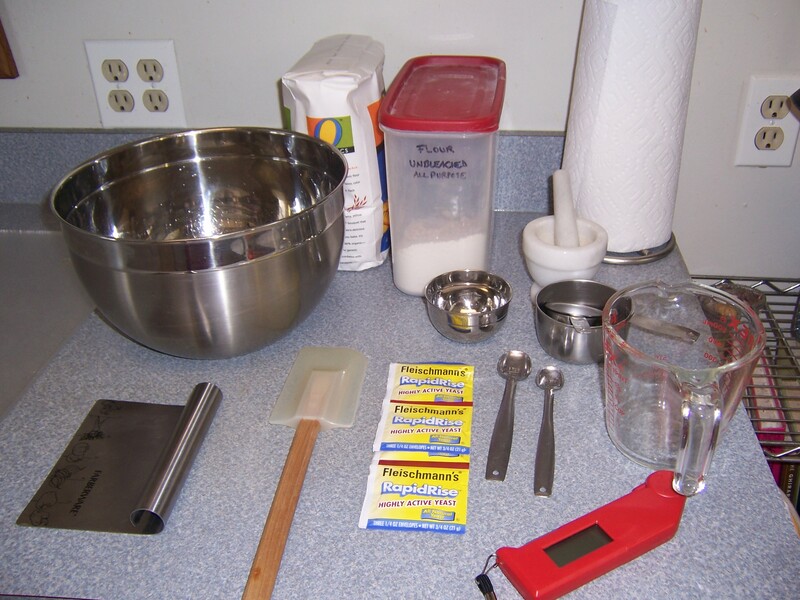 I had my yeast and my flour and my salt and my big mixing bowl and my measuring implements and my digital-instant-read thermometer ready because by gum Mr. Vatinet’s instructions are mighty specific. I had already rebelled against one requirement – the creation of a dough log to mark down all measurements and times and temperatures involved with the baking process – but otherwise I was trying hard to stick with his methods, which are a lot more technical than Mr. Beard’s. Trying out the new kneading method. The biggest difference was in the mixing and kneading. 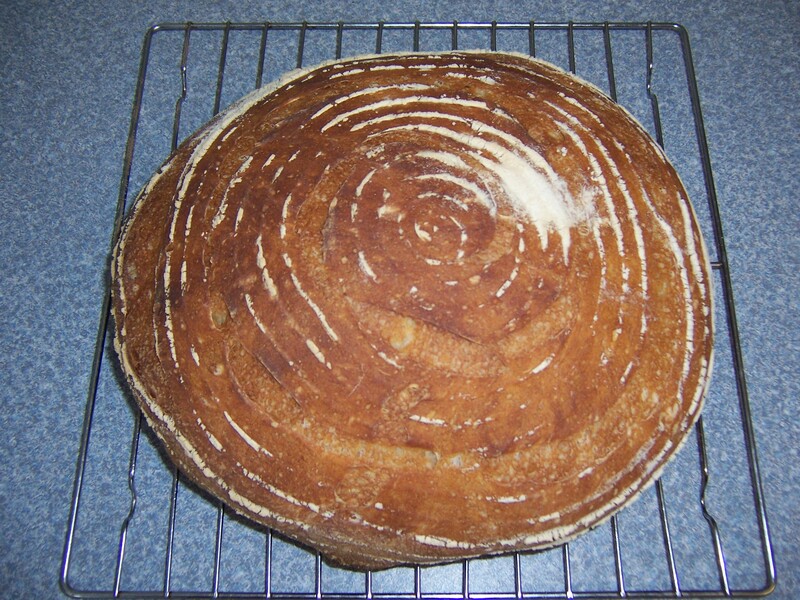 Bread is mostly yeast, flour, salt and water. Vatinet cautions you against letting the yeast and salt even touch each other before the mixing process starts, whereas Beard couldn’t care less about such familiarity. Vatinet wants you to use your exquisitely cleaned hands for the mixing process (unless you’re using an electric mixer) whereas Beard advocates a wooden spoon. Following Vatinet’s instructions, I kept my salt and yeast strictly segregated until I plunged one hand into the mix while with the other, slowly added the warm water (82-84 degrees, thankyouverymuch). Vatinet wants you to turn the bowl steadily while mixing and pouring, and I wished very much for an instructional video on how to do this as it seems to require a third hand. Beard doesn’t seem to give a flip how you incorporate the ingredients. Once the ingredients are incorporated, you turn the sticky mass out onto your work surface and start the kneading. This is where things get tricky. Beard advocates flour on the work surface and adding more flour as you knead, using the traditional fold-press-quarter-turn-and-repeat method. 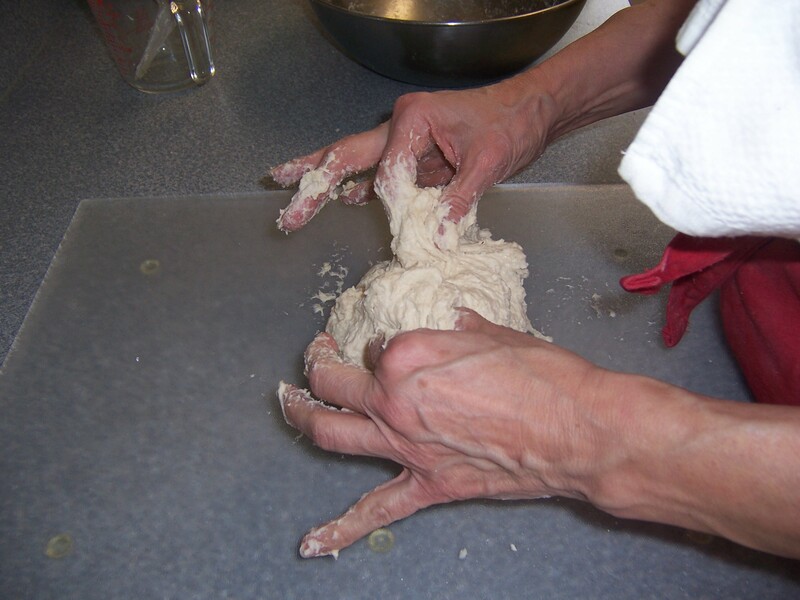 Vatinet wants you to use as little additional flour as possible, and his kneading method involves jabbing your index fingers and thumbs into the mix, pinching them together to form an OK sign, and then pressing the pinched dough up and into the middle of the dough mass. It was very sticky business at first. I was working on a plastic work surface which kept lifting up every time I worked the dough, so I had to holler for John to come take it away while I continued kneading on the kitchen counter (which, fortunately, I had scrupulously cleaned beforehand). I confess to some doubt about this method, but after several minutes of hard work (and it IS a lot harder than the old-fashioned kneading method), the dough began to come together in a very pleasing fashion. 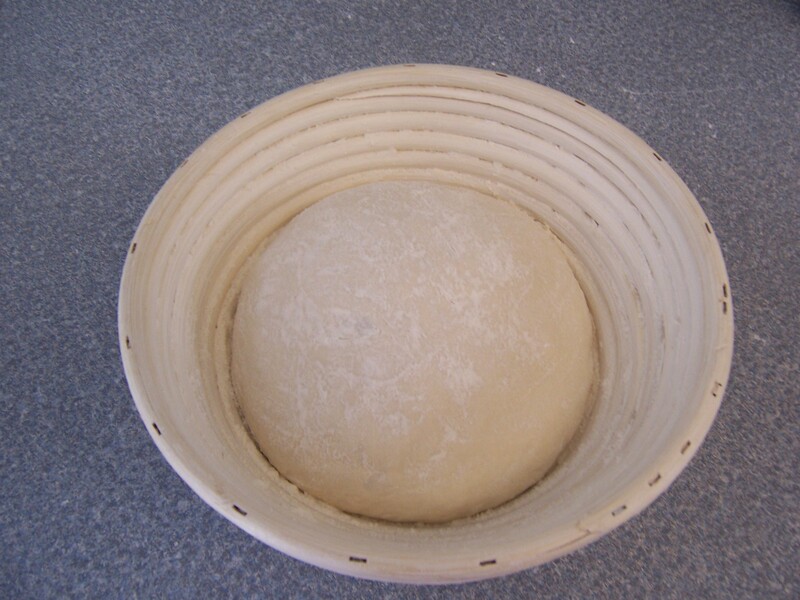 I formed the dough into a ball, popped it into a lightly floured bowl (as opposed to the buttered bowl Beard likes, but then Beard is a big butter fan) and covered it loosely with plastic for an hour-long rise in a warm, draft-free spot. 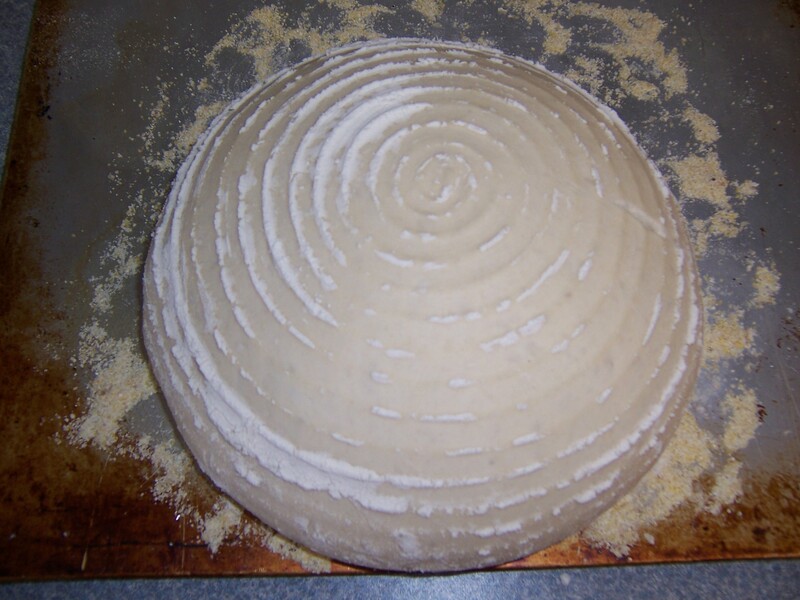 It didn’t rise a great deal – it barely doubled in bulk – but I moved on to part two: shaping the dough into a boule. This was actually kind of fun. Placing my hands in a v-shape, I rolled the ball toward me on the counter, putting pressure first on one side and then on the other. 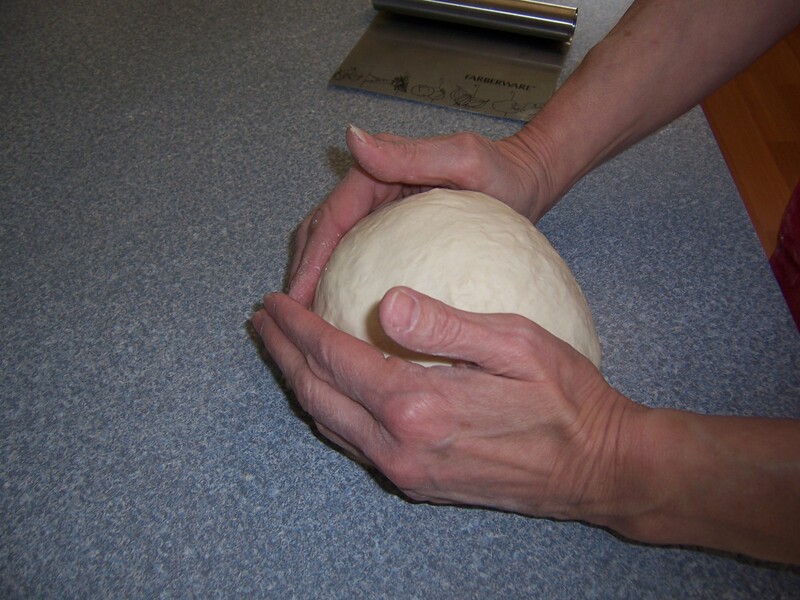 The dough smelled good and was nice to work with, and the method almost as therapeutic as old-fashioned kneading. Beard doesn’t do anything special with his boule formation – heck, he doesn’t even call it a boule. Next came the dough’s second rise, in the fancy new banneton (to your right, over there). Isn’t that the prettiest thing? You have to dust the banneton with flour before you use it, making sure you get flour into all the crannies so the dough doesn’t stick. I dusted the dough’s exposed bottom with a little more flour, covered it lightly with plastic wrap, and then moved it back to its warm, draft-free spot to await its second rising. The really beautiful part of the banneton use comes after the second rising, when you turn the dough out onto a cornmeal-dusted surface (and yes, I used Yates Mill cornmeal because I Have A Connection). The top of the risen boule will be imprinted with the concentric rings of the banneton, which gives it that lovely artisanal look. Using your razor blade (or your lame, if you’re fancier than me), you can score the dough following those rings, or be more decorative and score across them. Vatinet says you should develop your own special scoring pattern, but I wasn’t feeling that arty yet. When the boule had cooled, John and I had a slice. I thought it was a bit on the chewy side, with the flavor just a trifle bland. Nevertheless, we devoured half the loaf with some good olive oil for dinner. Next time I will score it a bit more deeply, reduce the baking time a hair, and perhaps add some flavorings (I’m dying to try Vatinet’s recipes for Kalamata Olive bread and Beaujolais bread). I’ve fixed your title, and I would be pleased to death if you want to share the post. Donna – just for your information when Rey puts his dough in the banneton he covers it with one of those cheap, clear chain-store shower caps, a huge quantity of which you can pick up for next to nothing, and it seems to work just fine. He uses an old (floured) cast iron Le Creuset casserole with the lid on for the first bake and then finishes it off without the lid. Perfection pretty well every time, although sadly less than perfect for my waist line. What a good idea, Gordon! 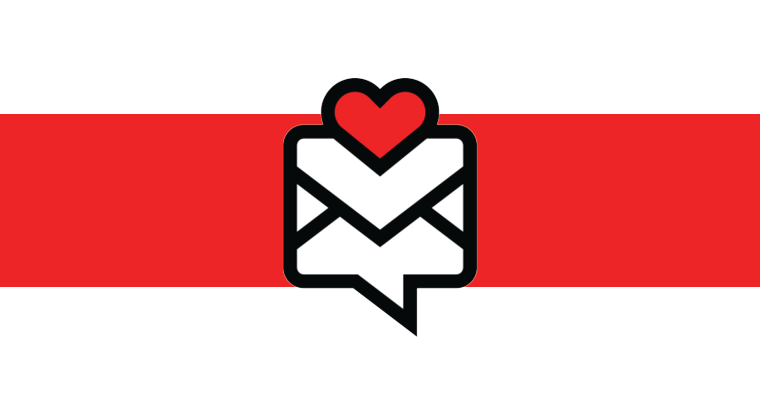 Thanks for sharing it with me!